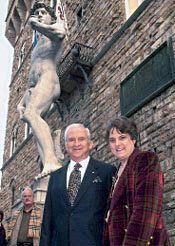 Mel Sembler, U.S. ambassador to Italy, stands before Florence's Palazzo della Signoria with Daria Holowell, U.S. consul general in that city, during an official visit. Mel Sembler (C52) learned something from a course on semantics, taught by the late communication professor Irving J. Lee, that would guide him when he was appointed ambassador to Australia and Nauru in 1989 by President George H.W. Bush. And it continues to influence him in his current post as ambassador to Italy. "Essentially [Lee] taught me how to understand the use of language, how to appreciate what others are trying to communicate," says Sembler. "In all endeavors, but in diplomacy especially, you have to know how to listen." Sembler always remembers to listen carefully but also to observe closely. "To be effective, a diplomat must understand that different cultures have different expectations for working relationships," he explains. "Many approaches that worked in [Australia] would fall flat here in Italy. For example, Australians are very informal and very direct, even in their official diplomatic encounters. Standing on ceremony would not work there. Italians, on the other hand, expect a kind of diplomatic protocol that they have relied on for centuries. Here, informality is usually not appropriate in official settings." Before serving overseas, Sembler founded St. Petersburg, Fla.-based Sembler Co., one of the largest shopping center developers in the southeastern United States, in 1962. He became a leader on a worldwide scale when he served as president of the 40,000-member International Council of Shopping Centers in 1986 and 1987. Sembler had already taken on an executive role when he was at Northwestern. He was elected senior class president, thanks in part to his future wife, then known as Betty Schlesinger (WCAS53), who found just the right slogan for his campaign: "Be wise, Semblerize." Sembler has also taken charge when hes felt the challenge of social or political issues. He and his wife founded a nationwide adolescent drug treatment program that helped more than 12,000 young people over its 17 years of existence. He was a member of the board of the Florida Holocaust Museum and also the finance chair of the Republican National Committee. Appointed ambassador to Italy by the current Bush administration last November, Sembler faced urgent challenges after the terrorist attacks on the World Trade Center and the Pentagon and the plane crash in Pennsylvania. "The world changed on Sept. 11," he says. "This was brought home to me in dramatic fashion when I visited Central Command, which is directing the war in Afghanistan. There, in Tampa, Fla., I saw officers from dozens of countries, including Russia, working to defeat terrorism." Sembler believes that a focus on that kind of unity is essential. "I think that all of us in the diplomatic service found that our jobs suddenly became much more important after Sept. 11," he says. "Global terrorism demands a global response. We are all working hard to create a coalition of like-minded nations to defeat this terrible scourge." While Semblers responsibilities as ambassador have become more challenging, being posted in Italy has its advantages. "I miss my children and grandchildren, whom I left behind on the other side of the world in Florida," he says. "On the other hand, they do like to come visit me here in Rome."  N.D.M.